The Grob G 120TP is a two-seat turboprop training and aerobatic low-wing aircraft with a composite airframe, built by Grob Aircraft. It is based on the Grob G 120A training aircraft and has been developed for military and civil pilots training. It has a retractable tricycle landing gear and a low tailplane. The first customer was the Indonesian Air Force. EASA Part 23 type certification was completed in May 2013. Designed to be a further development of the G 120A, the G 120TP turned during the development process into a nearly new type of aircraft. Due to the new powertrain, the G 120TP offers new capabilities for basic and advanced pilot training where it can be used as a lead in for a jet trainer. The airframe is made of fiberglass reinforced plastic and is stressed to +6/-4g. The wings are made of carbon fibre composites with winglets. The cockpit provides room for students and teachers wearing military equipment and helmets. The HOTAS control system is similar to that found in other types of aircraft that students may fly later in their careers. Therefore, basic and advanced flight training for future transport aircraft, helicopter or jet pilots will be possible. The cockpit is equipped with movable seats, or optionally, the new Martin-Baker Mk.17 lightweight ejection seats. The instrument panel can be equipped with a 4-screen Genesys Aerosystems IDU-680 EFIS. An autopilot and air conditioning system are available as well as an oxygen system and second thrust lever. Argentina is the second operator of the G 120TP. Deliveries of the first batch of four aircraft started in June 2013, with a total delivery of 10 aircraft(+5). Ceremonial handover of 4 of 18 (plus 14 on option) G 120TPs to the Indonesian Air Force. The launch customer for the G 120TP was the Indonesian Air Force, which operates a fleet of 24 aircraft plus additional 6 follow-up orders, as well as a G 120TP – Flight Training Device. The Royal Jordanian Air Force (RJAF) awarded Grob Aircraft an order to supply 14 aircraft among which one CBT System and one G 120TP FTD for elementary pilot training. The aircraft entered service in April 2017. Around that same time Grob confirmed it had delivered 12 of the 14 ordered aircraft. In January 2018, the Bundeswehr announced it had donated two aircraft to Jordan. The Mexican Air Force (FAM) has selected the Grob G 120TP as its new elementary trainer. The contract contains 25 aircraft (+15) equipped with the Genesys Aerosytems EFIS IDU-680. The delivery of the first batch was in February 2015 and final batch in February 2016. The training will be completed by a Computer Based Training (CBT) System and four G 120TP Flight Training Devices. The Myanmar Air Force operates a fleet of 20 G 120TP (+10) training aircraft equipped with Genesys Aerosystems EFIS IDU-680. The pilot training will be supported by a CBT System and one G 120TP FTD. The UK Military Flying Training System (MFTS) provides tri-service Elementary Flying Training to British military pilots on a fleet of 23 G 120TPs. The system replaces separate flying fixed-wing and rotary training programs for the Royal Air Force, Royal Navy and Army Air Corps. The service provider Ascent uses the G 120TP together with the Beechcraft T-6 to provide initial, basic and advanced training. The United States Army selected the G 120TP to provide comprehensive initial and recurrent training for more than 600 U.S. Army and U.S. Air Force fixed-wing pilots annually, covering transition of army rotary-wing aviators and training of army initial-entry fixed-wing students. Together with CAE USA, Grob Aircraft will provide turnkey training services including academic, simulator, and live flying training with a total of 6 aircraft, 1 Flight Training Device and 1 Procedures Trainer at a new training center to be built at Dothan Regional Airport in Alabama, close to the U.S. Army's Aviation Center of Excellence (USAACE) at Fort Rucker. 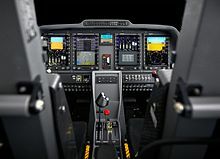 The Digital Cockpit of the G 120TP consists of 4 EFIS Cobham/Chelton Flight Systems IDU-680. ^ "El país incorpora cuatro flamantes aviones de entrenamiento militar". Ambito.com. Retrieved 2013-06-12. ^ Binnie, Jeremy (24 April 2017). "Jordan unveils Grob trainers". IHS Jane's 360. London. Retrieved 28 April 2017. ^ Binnie, Jeremy (16 January 2018). "Germany donates equipment to Jordan". IHS Jane's 360. Archived from the original on 16 January 2018. Retrieved 16 January 2018. ^ Carlson, Stephen (17 July 2017). "Grob 120TP training aircraft ready for British military use". United Press International. Archived from the original on 18 July 2017. Retrieved 18 July 2017. ^ Grob Aircraft (n.d.). "Grob G 120TP Technical Specifications". Retrieved 20 March 2012. Wikimedia Commons has media related to Grob G 120TP.